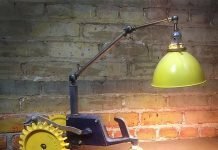 Lots of old lamps end up in landfill. Too bad because these lamps are still looking good and should have a second life. But what to do with them? 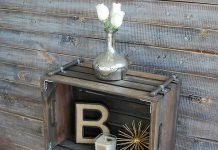 Of course upcycling is an option and certainly a good one. Only this time the discarded object, a lamp, is turned into a new lamp. So in a way the function stays the same, but the new product has more value. And it’s far more interesting and fascinating. Design duo Mischer’Traxler, Wien | Austria, started their project to focus on light sources. They were asked to participate in a 2010 lighting exhibition at Gallery Klaus Engelhorn in Vienna and came up with the award winning idea to combine two lamps into one. This way they created a new design that uses a energy-efficient fluorescent tube bulb and gives the lamps a whole new character. 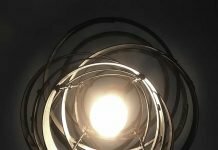 The name of this limited edition lamp series is Relumine and the idea is that we all have to switch from old light bulbs to new energy saving light sources. 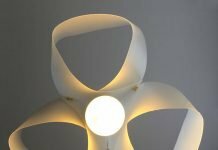 The fun and challenge is to combine different types of lamps, like a hanging pendant with a floor lamp, a floor lamp with a desk lamp or different heights and hardware. 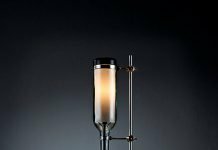 Each Relumine uses two, discarded lamps, which are disassembled, sanded, newly lacquered and adapted with newer technology, before they are connected by a glass tube which holds the eco friendly light source tube. Together these two lamps need less energy than each one in its previous life. Studio Mischer’Traxler was founded 2009 in Vienna. Designers Katharina Mischer and Thomas Traxler met during their study. They completed their BA-degrees in product and furniture Design at the NDC St.Pölten and at Kingston University London. They also both graduated from the IM-Masters department at the Design Academy Eindhoven in 2008.